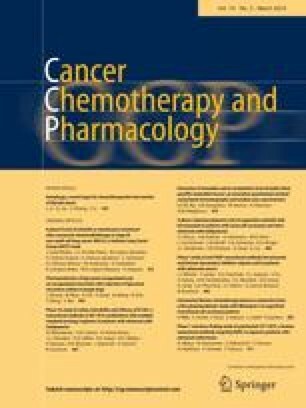 Purpose: A multi-centre randomized phase II study of single agent nolatrexed dihydrochloride versus doxorubicin was undertaken in Chinese patients with advanced hepatocellular carcinoma (HCC) to study and compare the clinical efficacy of the two drugs. Methods: Fifty-four patients with clinical or histological diagnosis of HCC were randomized in a 2:1 ratio to receive nolatrexed or doxorubicin. Nolatrexed 725 mg/m2/day was given by continuous infusion via a central venous device for 5 days and doxorubicin 60 mg/m2 was given as a rapid intravenous infusion every 3 weeks. Results: No objective responses were observed in either treatment arm. Two patients in the nolatrexed arm and none in the doxorubicin arm had >50% decline in serum α-fetoprotein. The median survival for the patients in the nolatrexed and doxorubicin arms was 139 days and 104 days, respectively. Moderate toxicities including leukopenia, thrombocytopenia, mucositis and skin rash were observed in both treatment arms. Conclusion: Nolatrexed and doxorubicin are minimally active in the treatment of advanced HCC. Given the small sample size, no difference is observed between the two drugs.